There is a lot to say about the latest GDP revisions, particularly as it relates to the breakdown of the measure in comparison with something besides itself. The headline was all that was needed to “confirm” the best economic growth in decades, though. That last part is the trickiest, as GDP is synonymous with “national income” but is strangely crafted in how “that side” of the ledger is balanced. You would think there would be evidence of this “more income” somewhere, as though second derivatives were as good as actual results. In other words, the baseline comparison of Q/Q was established for this “best growth in forever” in the feverish downward revisions of Q1. That makes it all the more difficult to tell exactly what GDP is saying about the economy. A full part of the downward revisions then were due to the high degree of uncertainty (meaning no prior data upon which to statistically model) surrounding healthcare spending. That is the primary drawback of measuring economic progress from an expenditure standpoint. GDP treats all spending as roughly equal in terms of true growth when that is decidedly not the case. Government spending is the most egregious addition to the statistic, but perhaps only one step away is insurance, as in health insurance. Would anyone (other than a Keynesian) say that the economy is much “better” if a tax were imposed to directly finance government spending on something? Redistribution can occur without direct involvement of the Treasury Department. If millions of people have to pay double for car or home insurance next year, GDP might be positive but at the expense of something else. 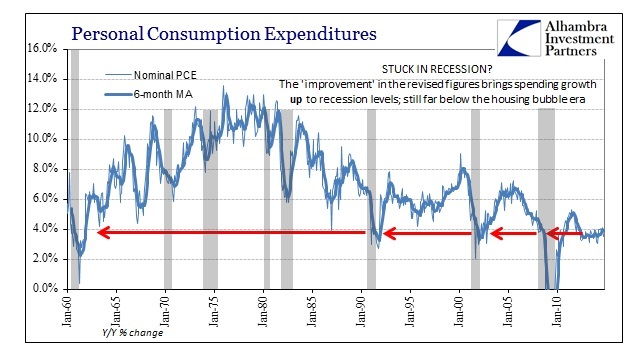 The effects of this increase in estimated spending are obvious on the trajectory of Personal Consumption Expenditures (PCE). Revisions even to the monthly data series are significantly higher in direct proportion to what was “found out” in the QSS (Quarterly Services Survey). The QSS changes were really narrowed to healthcare, accounting for 69% of the increase in the PCE revisions (if you add financial services the proportion was 79%, meaning a lot of spending on two of the three segments with the lowest “multiplier” effect). That “bump” at the end of the blue line above is what all the fuss is about. 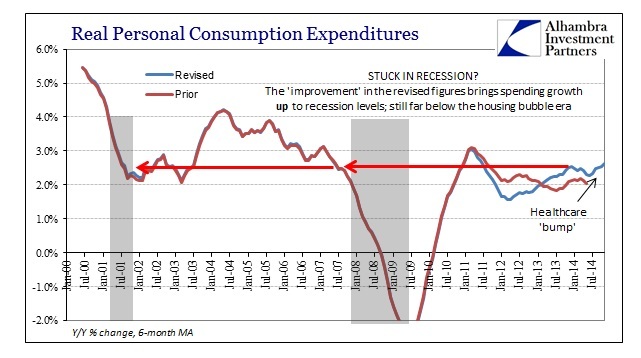 Since this increase in spending has to be accounted somewhere, there is an offset. You would think, intuitively, that spending should be linked to income, as suggested by the credentialed economist quoted at the beginning, but that is the nature of redistribution; in this case increasing spending without any relation to income (this is not commentary about the political benefits or costs of the ACA law only the economic effects outside of DSGE tinkering). As spending is revised upward to account for the long-awaited “bump” in healthcare insurance, the balancing factor has been made in the savings rate. 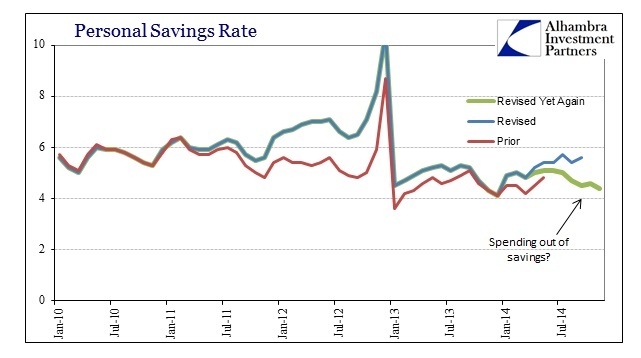 Thus the savings rate has been revised (yet again in a significant manner) downward to where it was at the end of 2013 (and the atrocious economic environment that led to the Polar Vortex excuse). The entire third quarter saw the monthly calculated savings rate drop from 5.7%, 5.4% and 5.6% to 5.0%, 4.7% and 4.5%, respectively. That is a lot of savings used to “finance” mostly healthcare. 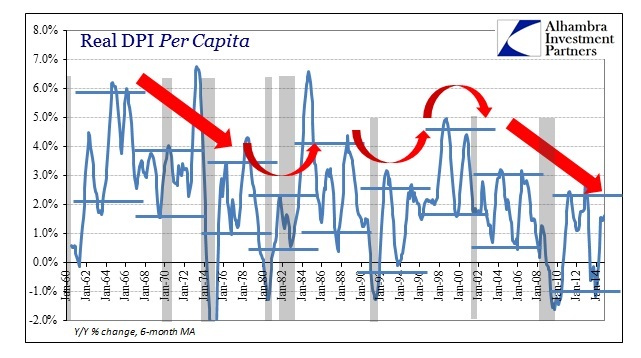 In reality however, where GDP falls short is in its relationship to itself. What looks like 5% GDP growth in the current quarter is tiny in historical comparison. 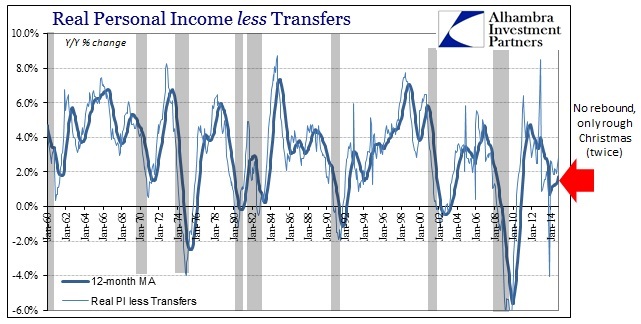 Nominal spending remains stuck at levels usually associated with recession (which is why income remains so scarce as spending feeds revenue, and deficient revenue expansion forces businesses to remain overly cautious about labor expenses and expansion). 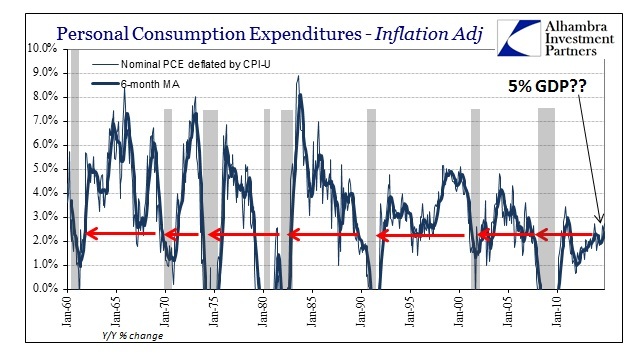 Even in “real” terms, using the CPI-U as a deflator (because it is never revised, unlike the PCE deflator), spending is no better. So what accounts for the 5% GDP, especially the huge upward revisions that have economists convinced that the economy has rarely been better? That historically miniscule uptick at the end of the chart above. Economic relativity. If the economy were truly taking off as is asserted monotonously and repeatedly, income would be among the first to show it – and not just compared to last year but comfortably aside historical periods where the economy actually performed and true wealth was created in abundance. Furthermore, and the real downside to GDP measurements of this type, there really isn’t any sustainable advance to be gained by making sure insurance companies generate more revenue at the expense of other more efficient means of economic distribution. Perhaps that is why even the most optimistic of credentialed economists are more pessimistic about Q4 (currently estimated back into the lower 2’s again). This may, however, offer one compelling reason for the far worse state of retail sales and other “spending” metrics in real dollars. If a large marginal proportion of the population is spending money on health insurance that they never had before (or paying significantly more than in the past), they would certainly have far less discretionary income to spend elsewhere. In other words, far less people than expected shopped in November (and so far in December) because this year presented them with something like a huge tax increase. That supposition is made all the more appealing given how the BEA had to reconfigure the savings rate. Not all spending is the same, especially when it is untethered to already-scarce incomes. Just don’t tell that to GDP.